Download a free demo copy! 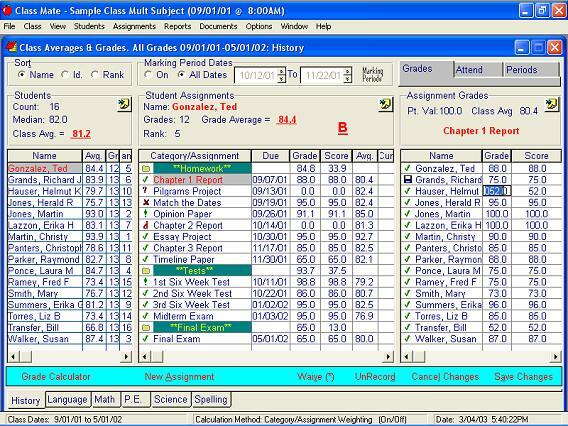 Class Mate gradebook software makes it easy for teachers to calculate, manage and organize their grades. Common tasks are performed quickly and easily on the programs main screen. You'll save time and always know how each of your students is performing. Class Mate handles category and/or assignment weighting, multiple marking periods, multiple subjects, and can calculate final grades based on average of marking periods. Whether you teach a college class with hundreds of students, or a grade school class with multiple subjects, it has the features you need. Don't let the list of gradebook features scare you though, it's easy to learn and use. A complete set of student and classroom reports to make your job easier and help communicate with your students and parents. Reports can be saved as Adobe PDF files, and can be automatically e-mailed to students or parents. You can upload reports to your own web site and use our free portal page or you can optionally post your grades and reports on the Internet at our R-Link or C-Link sites! There is an option to install as a portable application directly to your USB drive for 100% portability! Even on a desktop, Class Mate stores all of a teacher's classes in a single file making it easy to move data between different computers, or to backup and protect your work. You can copy or e-mail your "teacher file" back and forth between school and home if you regularly work in both places. Student rosters can be imported from Excel files. Classroom data can also be exported to Excel* files making it possible to interface with administrative software or to create your own mail merge reports or letters. From attendance tracking to seating charts to conduct grades. Our grading program has the features you need. Try it for free! Sample classes are already set up making it easy to get started. After a few minutes, you'll be ready to set up your own classes and start entering your grades. Download the Free Demo.